Perio Disease and Sugar; Not so Sweet! If you lived in the days before we Americans drank soda like water and before the sugar industry began a full-throttle campaign to deflect attention from sugar as the cause of disease, you probably heard something like this regularly: "Stay away from sugar -- it will rot your teeth." Today, in the face of an obesity and diabetes epidemic and other accompanying diseases -- and with low-fat diets failing to correct these problems -- we hear sugar warnings once again. Does sugar "rot your teeth?" Yes, but the relationship between sugar and rotting teeth is more complex. Bacteria living in the mouth digest carbohydrate debris left on your teeth after you eat, and this process causes dental decay. Bacteria form a sticky plaque which produces acid. Plaque and the acid it produces is the direct cause of decay. Some debris is what we expect, things like cake, cookies and candy -- but carbohydrates include whole wheat bread and even vegetables. Since a healthy diet includes 40-65% carbohydrates, this means another line of defense against dental decay is frequent brushing to remove plaque. It also, however, includes a real food diet, that is, a diet in which the carbohydrates are intact with all their fiber. The fiber serves like a toothbrush, removing plaque as you eat. 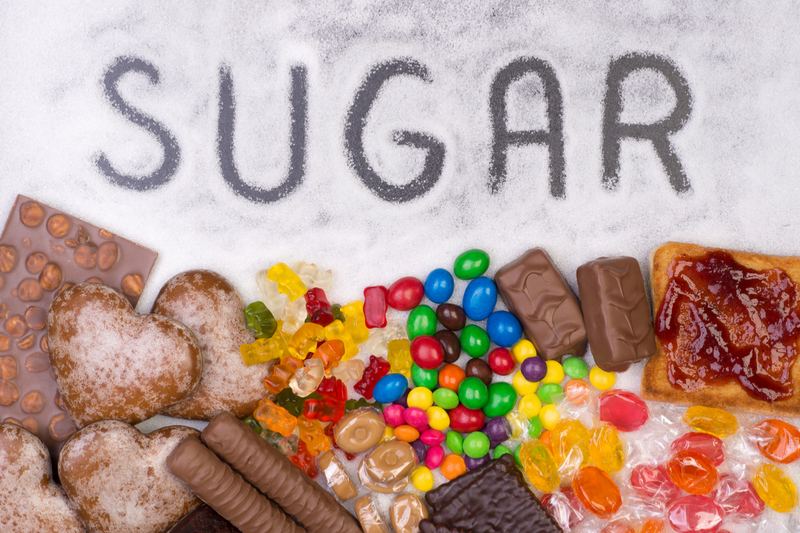 Refined, high sugar content, processed foods don't have that plaque-removing capability. Coincidentally, or perhaps not so coincidentally, these same real foods are most beneficial to those who must control blood sugar levels. The relationship between dental disease and systemic disease with sugars at the heart of that equation extends further. "Research shows that there is an increased prevalence of gum disease among those with diabetes, adding serious gum disease to the list of other complications associated with diabetes, such as heart disease, stroke and kidney disease." Newer research suggests the relationship is two-ways, that those with gum disease are more likely to have diabetes and related diseases. "If your blood glucose levels are poorly controlled, you are more likely to develop serious gum disease and lose more teeth than non-diabetics. Like all infections, serious gum disease may be a factor in causing blood sugar to rise and may make diabetes harder to control." According to an article in Diabetologia (2012 Jan; 55(1): 21–31), "Periodontitis and diabetes: a two-way relationship," periodontal disease and diabetes are intimately linked through inflammation: "Inflammation is a central feature of the pathogenesis of diabetes and periodontitis." What does all of this mean in plain words? It means what we have long known, that the best diet for all of us to follow is one that was once recommended to diabetics. As Michael Pollan advises, "Eat food. Not too much. Mostly plants." This is a diet of real food, weighted to plants; protein and good fats; and limited added sugars. It serves those who want to keep their blood sugar levels in a normal range, avoid weight gain, diabetes, dental caries, periodontal disease, heart disease, stroke and some forms of cancer, all inflammatory conditions correctable with lifestyle changes. So brush and floss your teeth to reduce plaque. Visit your dentist at least twice yearly for professional cleaning. And remind yourself of the wisdom we once took for granted: while it's not a direct relationship but rather an insidious and pervasive one, sugar does rot your teeth...and maybe the rest of your body.